The Campania region around Naples was the Hamptons of ancient Rome, where the rich built sumptuous summer villas and emperors went to retire. The province also boasts some of Italy's most gorgeous scenery, from the seductive island of Capri to the singularly beautiful Amalfi Coast and its famed fishing towns-turns-resorts of Positano, Amalfi, and Ravello. In Naples, you can delve into the 18th-century court of the Bourbons at their royal palace and theater, or pay homage to Caravaggio in one museum and ancient sculptors in another in between visiting baroque churches and sampling pizza in the very restaurant that invented it. From a base in Naples or resorty Sorrento, you can day-trip to visit one of the most destructive forces in western history, Mt. Vesuvius. A short train ride will take you to Pompeii and Herculaneum, two cities completely buried by the volcano's wrath in AD 79, frozen in time and offering an unparalleled glimpse into daily life almost 2,000 years ago. To cycle back even further in time, head to southern Campania, where you can wander amid the columns of some of the most intact Greek temples in the world in the forgotten 5th-century BC colony of Paestum. Campania is a region that lends itself well to home-basing/day-tripping mode of traveling. 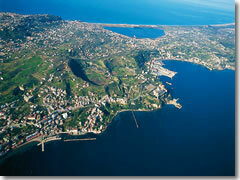 The two most convenient bases are the capital city of Naples and package tour–resort town of Sorrento. Sorrento offers very little to see in town itself, but is better positioned for the Amalfi Coast and Capri, and is considerably safer and cleaner than Naples as a city. Naples has a wealth of sightseeing and is cheaper. Base in whichever is closer to your own day-tripping dreams, or spend a few nights in each for ultimate convenience.